For spinal stenosis patients who prefer to avoid fusion, Dr. Bierstedt is working with the TOPS™ System from Premia Spine. Lumbar Spine: Dr. Bierstedt works with the state-of-the-art posterior arthroplasty and artificial disc technologies. For spinal stenosis patients who prefer to avoid fusion, Dr. Bierstedt is working with the TOPS™ System from Premia Spine. Spinal stenosis patients (who may also have facet arthrosis and spondylolisthesis) typically have this disease state between L3 and S1. Dr. Bierstedt treats patients with debilitating disc disease at the typical lumbar levels L3 thru S1. He is one of the few in the world that replaces the discs at higher lumbar levels L1 thru L3, through a lateral surgical approach. Cervical Spine: Dr. Bierstedt also performs cervical spine disc replacement procedures with the leading disc products. Philosophy: Dr. Bierstedt will only do 2 surgeries per day; 3 surgeries if there is an emergency. This allows Dr. Bierstedt enough time to consider each patient’s needs, and he will not rush through any procedure. Education and Experience: Dr. Bierstedt studied medicine from 1991 to 1998 at the Westphalian Wilhelms University in Münster and received the license to practice medicine in May, 1999. His doctorate to the MD was achieved in October, 1999. He began his neurosurgical education in the Knappschaft Hospital under Mr. Prof. H. Kretschemer and continued from the middle of 1999 in Bodelschwinghschen Hospital of Bielefeld with Mr. Prof. Oppel, where he worked as a a resident until September, 2004. 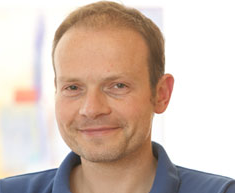 He graduated as neurosurgeon in 2005 in Bielefeld. From December, 2005 to March, 2008 Dr. Bierstedt worked as a senior physician for neurosurgery and leading senior physician for spinal surgery in the Knappschaft Hospital of Recklinghausen under Mr. PD Dr. Puchner. From 2005 to 2008 Dr. Bierstedt established a national center in the Knappschaft Hospital of Recklinghausen for spinal surgery with a special focus on mobility-retaining interventions (artificial disk replacement) as well as spinal trauma. From 2008 to 2010, he expanded his education to manual and chiropractic therapies. Dr. Bierstedt and his group perform surgeries in different hospitals in the Ruhr-Area in Germany.